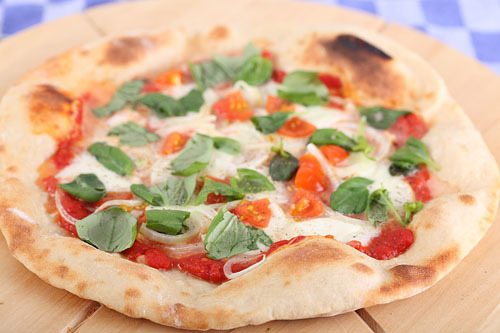 For our new recipe check out our latest pizza baking and dough making with our new oven here! What’s true for the tomato sauce also goes for the pizza crust: less is more. If you want an authentic Italian pizza that is. I think they are the best, so I stick to the simplicity of it (not that making a good pizza is simple!). Try this recipe and see if you like it and can make it your own. Even the olive oil is optional. And remember, good pizza has a lot to do with the baking. Professional pizza ovens are very hot and have a stone floor. Try to get as close as possible to recreating these conditions (oven temperature to the max and well heated pizza stone). More time? More taste! Check out our recipe for pizza dough with a poolish. Stir together the flour, salt, and instant yeast in a bowl. Add water and mix for 7 minutes in your mixer with dough hook attached, or until the dough is smooth and slightly sticky (by hand it will take a bit longer, 10 to 15 minutes, depending on your technique). You can add the optional olive oil as soon as the dough starts forming a ball. The dough should clear the sides of the bowl but slightly stick to the bottom of the bowl. Transfer the dough to the worktop, lightly dusted with flour. Prepare a sheet pan by misting it with spray oil . Using a dough scraper, cut the dough into 4 equal pieces. Lift each piece of dough and gently form it into a ball. Transfer the balls to the pan and cover with floured or greased plastic foil. Leave to rest at room temperature for 1 hour. At least 45 minutes before making the pizza, place a baking stone on the floor of your oven, or on a rack in the lower part of the oven. Preheat the oven as hot as possible, (most ovens won’t go higher than 300ºC / 570ºF). We use the Bestron Alfredo pizza maker, it has a stone and two heated spirals and can reach temperatures above 350ºC / 660ºF and works really well for such a simple device. Place the dough balls on top of a floured worktop and lightly sprinkle them with flour; dust your hands with a bit of flour. Take a ball of dough and gently press it into a flat disk. Now you can try tossing the dough like a real Italian pro but this is a skill that requires some practice (I can’t do it). You can, like most people, resort to using a rolling pin and roll and stretch the dough into a disk of about 25 cm /10 inches. Now lay the pizza on the peel or pan, making sure there is enough (semolina) flour to allow it to slide. Lightly top it with sauce and your other ingredients of choice (start with 3 or 4 ingredients, keep it simple to give the crust a good chance to bake). Slide the pizza onto the hot stone and close the door. Keep an eye on it and see if after 2 minutes or so it needs to be rotated for even baking. The pizza should take about 5 to 6 minutes to bake. Remove the pizza from the oven and transfer to a cutting board. Wait a minute before slicing and serving, to allow the ingredients to set. Enjoy your dough making and pizza baking! We do not have a link to a recipe but it is very simple the way we do it. Basically take a can of tinned tomatoes (ours are 400 grams). Add up to halve a table spoon of sugar, depending on the sweetness of the tomatoes (taste to check) and about halve a teaspoon of salt (again to taste of course). Always a good idea to start with less and add more if needed. Now take a stick blender or run to a food mill with a coarse plate for a different texture. Ready for use! If the tomato sauce is a bit too wet, you can cook it down to the right consistency. This basic sauce is full of tomato taste and a great carrier for other ingredients / toppings, with which you add other flavours. They do not need to be in the sauce. When you say- The dough should clear the sides of the bowl but slightly stick to the bottom of the bowl. Does this mean that the dough should reach the window pane stage? The quick answer is yes, it is good to aim for window pane. It of course depends on what flour you use and what kneader or kneading method if the kneading minutes indicated in the recipe would be enough to reach good gluten development. If you need a few extra minutes for good development, just add them. The clearing of the bowl and stick to the bottom part is there to also indicate the right moisture level of the dough. So again, if your flour is different and it can take a bit more moisture, just add some. Practice and experience will teach you the right levels for your conditions. If we are making the pizza base in the convection mode, at what temperature and time should it be put into the microwave? We have never tried this ourselves with pizza, but pizza should, if possible always be baked at the highest possible temperature of your oven (so if it is 250C use that). It will take longer than the indication of the 5 minutes we give in the recipe, but we do not know how long with your oven. Make sure to keep an eye on the pizza to see how it goes and if it bakes evenly, otherwise turn it a few times. if I have 1000g flour how the quantity should I add from poolish? Basically you can use any amount you want up to around 50% of the total amount of flour, The higher the percentage of pre-ferment you use the more your bread crumb will have a nice chewy texture. For pizza we would advice to use around one third of the total flour for the poolish. But there’s also a personal preference of course, so you should just experiment with it and see what you like best. I just enjoyed some lovely pizza’s with my family. First time I made my own dough for pizza and it worked wonderfully. – I used regular bread flour, likely a bit stronger than tipo 00, it resisted forming to a thin dough a bit. Adding a few minutes of waiting time during forming helped. – I used 230 ml instead of 220 ml, which seemed better for my flour. – I used 17 ml (5%) strong olive oil, a bit more than the 1 tbsp, which is more to my liking. Excellent, great to read how you already made the recipe your own with very good adjustments. If you use stronger flour you can also opt for shorter kneading. Relaxing the dough like you did also helps of course. We do not have any experience with these bread makers but assume that if it is working OK for bread recipes it will also work for this pizza dough recipe. We think it will be worth it to give it a try. I want to make pizza with my class for our Enterprise week. At the end of the week we sell the products we have made to the parents and other children in the school. We cannot make enough pizza in one day to sell. Do these pizza bases freeze well? If so, what do I need to do when I defrost them? I think it could work very well, but maybe a test run is a good idea. Good luck and fun with everything! Thanks for your help, Marieke. Will try this later this week. Als je pizzadeeg de dag voordien wilt maken wanneer plaats je het dan in de koelkast en hoeveel tijd op voorhand neem je het er uit? Als ik het goed begrijp moet je het niet eerst één keer laten rijzen platslaan en terug laten rijzen zoals bij het maken van een gewoon brood met gist. Ik heb pas onlangs jullie site leren kennen en ik vind hem echt heel goed bedankt hiervoor. How can I make pizza dough with your sour dough starter. Just enough for 2 x 12″ pizzas? All I have available to me for the pizza dough is bakers unbleached flour. The starter I made is from rye flour. I live in country Australia and don’t have much access to flour. 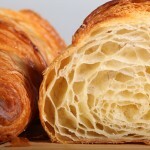 Your pain rustique is now my daily bread. 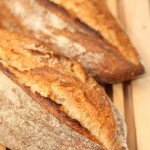 Great to hear about the pain rustique! We would take 10 grams of sourdough culture for every 250 grams flour we use (and about 140 g water, salt as you like), make a pizza dough with that and leave it for 24 hours in a cool place (around 18 C) and then use it to make your pizza. Yes, we also ship to Australia, very regularly. You can check this page for shipping details (www.weekendbakery.com/websh…l-shipping), shipping costs are automatically calculated for you after you register. If you need our help please let us know. I’m really fond of your site, and just started picking up bread baking. I use the flour sold by Voogd in Ouddorp, the village where my girlfriend lives. Last weekend, I tried out your basic pizza dough recipe, and it worked wonders. It gave a really nice crust, not like any frozen pizza I’ve ever had (so that’s a good thing!). However, I ran into a slight inconvenience. When rolling out the dough, it is so stretchy that it will not retain its form. It just shrinks back (a lot), so forming a pizza is nearly impossible. I put the dough on baking paper, and just stretched it until it became sticky on the bottom and stuck to the paper. It does this thing both at room temperature, and straight from the fridge (6 C). 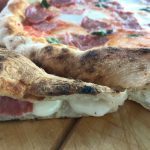 Is there any advice you can give me to make my pizza dough more moldable? Also, it doesn’t really have the firmness that I see on a lot of YouTube video’s, but it has the stickyness that you describe. There are a few things you can do to fix your problem. First of all the flour you are using probably has a rather high protein content. It is always good to know what flour you are working with so you know how to handle it (also see our post about flour: www.weekendbakery.com/posts…our-types/). When you develop the dough you develop two things, namely its elasticity and extensibility. 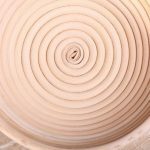 Elasticity, the stretchiness, is the tendency for the dough to want to shrink back into its previous shape. The ability to expand is called extensibility. The dough becomes more extensible, it will expand, as the gluten structure is allowed to relax. What we suggest you do next time is maybe cut down on the mixing a few minutes to develop less gluten. Next to that you can also roll out the dough as far as it goes without too much effort, then just leave for a few minutes to allow the gluten to relax. After that rest you will see it becomes easier to stretch it further. So less mixing and a few relax minutes is what we suggest. And stick to the resting times in the recipe, if you leave it for 2 hours instead of 1 for example, it will become even more elastic and harder to roll out. Thanks for your reply! This is really helpful information. Since I’ve just recently started baking bread, you can expect some questions from me if you don’t mind. I’m a chemistry student, and always looking to learn how things work. Bread baking as an exact science fits my persona, and intrigues me (and the results are more delicious than in the lab). You were spot on with your tips! I use a high protein Type 00 flour from the mill that I described. It even states on the bag: High protein content, especially for making pizza (hence my choice for this type). I was quite enthusiastic when the dough came together, so that I might have over kneaded the dough as you described. I was kind of playing around with it, admiring its firmness and ‘muscle’. Then I left the dough to rest, and went to the shop together with my girlfriend, and you know how things go with girls and shops hahaha. Nah, it was my own fault as well, but the 1 hour deadline we did not make. The dough probably rested for 2,5-3 hours. And we only used half of it, and put the rest in the fridge for the day after, at which point the dough was even more elastic (completely confirming your hypothesis). The pizza’s were delicious though. These tips surely will help when baking pizza’s next time! Thanks for your great advice, and for your great website. You have the right brain for baking 🙂 We’re sure next time it will be perfect pizza! I have a regular electric oven at home. What I do to bake pizza is preheat oven at the maximum temperature, in my case, 250 C. I prepare the pizza, I put it on baking paper and I place it on the floor of the oven with the help of a baking paddle or similar, because I want direct heat to the bottom of pizza, just like in the fire wood ovens. I put a little bit of cornmeal between pizza and the baking paper (that gives crunchyness). It takes 3-4 minutes to cook the bottom of the pizza. Then I bake it 2 minutes in the top of the oven until cheese is melted. For this I take the pizza out of the bottom and I place it on the hot tray, in the nearest position to the top. This is the best way I know on how to bake pizza with a domestic oven. Thanks for sharing this wonderful inventive method with us Abel! This will be helpful for many people because a lot of household ovens do not go over 250C. Rest mij nog 1 vraag: Ik kan nergens tarweBLOEM vinden dat én biologisch is én een juist eiwitgehalte heeft. Of heeft “jullie” molen (De Zandhaas) die wel? Of maken jullie alleen wit brood van bv speltbloem en niet van gewoon (niet biologisch) tarwebloem? Ja inderdaad, die heeft De Zandhaas wel en dat is precies de tarwebloem die wij gebruiken, met een proteïne-gehalte van tussen de 12 en 13%. Alleen het laten bezorgen zal een uitdaging zijn want dat doen ze voor zover wij weten (nog) niet. Je zou nog even kunnen informeren bij de Zuidmolen of het wel klopt wat er staat en waar hun bio tarwebloem vandaan komt. Die van ons komt overigens uit Nederland, uit de Flevopolder. Zoals je het brood beschrijft, gummie-achtig aan de binnenkant zou ik denken dat het mogelijk nog niet helemaal gaar is, dus niet compleet ‘uitgebakken’. Misschien nog een paar minuutjes extra in de oven. De ideale kerntemperatuur voor een gemiddeld brood als het gaar is, is 93.3C. Voor natte degen ligt dat zelfs nog wat hoger en moet je richting de 96C meten. Als je deze temperatuur niet haalt krijgt het kruim niet genoeg kans te stabiliseren. Hoop dat je er weer wat mee kunt en dat je een goede en handige bron voor je bloem vindt! oh vergeten te zeggen dat ik t ook voor pizza’s wil gebruiken. Ik heb het niet voor niets onder t kopje “basic pizza dough recipe” gezet. Als basis voor heel veel van onze recepten gebruiken wij tarwebloem die we combineren met verschillende meelsoorten. Als je ‘bloem’ ziet staan betekent dat dat het meel ontdaan is van veel van haar vezels en kiemen. Tarwebloem bevat nog wel een bepaald percentage vezels, de nog fijnere patentbloem is ontdaan van alle vezels. Als je het woord ‘meel’ ziet staan dan moet je daar eigenlijk altijd ‘volkoren’ bij denken. Dus meel betekent dat de hele korrel gemalen is en dat daar niks uitgezeefd is, je krijgt alles van de graankorrel. Dan heb je het eiwitgehalte van je bloem of meel. Dat is belangrijk voor je bakresultaat. Voor een goed ontwikkeld rustiek brood heb je bloem en meel nodig met een hoger eiwitgehalte. Minimaal tussen de 12 en 13 procent. De tarwebloem van onze molen zit in die categorie en de gewone tarwebloem van de Zuidmolen ook. De biologische tarwebloem heeft een opvallend laag gehalte, wat deze bloem niet erg geschikt maakt voor brood maar op zich wel weer voor pizza (minder glutenontwikkeling nodig). Italianen gebruiken voor pizza zelf ook de ‘Tipo 00’ bloem, die heeft ook een laag eiwitgehalte. Wij gebruiken onze bio tarwebloem ook voor het pizzadeeg en kneden dan niet te lang voor een niet te grote glutenontwikkeling. In de regel bevat Amerikaanse bloem veel eiwitten. Ook de patentbloem die je hebt gekocht heeft een eiwitgehalte van 13.8 %. Dat maakt deze bloem op zich geschikt om brood en baguettes mee te bakken. De patentbloem die wij in Nederland kennen wordt juist weer meer gebruikt voor cakes en koekjes omdat ze een laag eiwitgehalte heeft, dat geldt ook voor de Franse bloem. Als Amerikanen het over ‘bread flour ‘ hebben dan bedoelen ze doorgaans iets wat te vergelijken is met onze tarwebloem die een hoog glutengehalte heeft. All purpose flour heeft een eiwitgehalte van rond de 11% . Als je gaat vergelijken kom je nooit helemaal op hetzelfde uit maar onze tarwebloem zal een beetje tussen hun ‘bread flour’ en ‘all purpose flour’ in zitten. En dan is er nog de smaak. De verschillen tussen de diverse soorten kunnen enorm zijn. Wij gebruiken onze biologische tarwebloem, volkoren tarwe, -spelt en -rogge omdat als je het zo rauw proeft, het echt nog naar plant smaakt en dat proef je ook terug in het brood. Tot slot: Alles waar ‘broodverbeteraar’ in zit zou ik persoonlijk mijden. Dat is ook je voordeel als thuisbakker, dat je dit soort ongezonde toevoegingen juist weg kunt laten en met wat extra tijd een fantastisch brood kunt bakken. Binnenkort posten we nog een artikel over meel op onze website om er nog iets meer over te vertellen. Even in t Nederlands want ik heb een vraag over “breadflour” oftewel t tarwemeel (bloem?) dat jullie gebruiken. Jullie kopen dat zoals hierboven staat, t bij De Zandhaas. Ik heb op hun website gekeken maar er staan geen produkten met info over wat ze precies verkopen. Ik bestel zelf bij de Zuidmolen via hun webwinkel maar kan daar niet precies uitvinden welk tarwemeel ik kan kopen die t meest lijkt op dat van jullie. En bedoel je in t bovenstaande tarwebloem (wit) of tarwemeel (bruin of volkoren)? 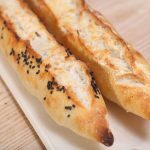 Daarnaast heb ik nog een vraag: Ik heb Amerikaanse patentbloem bij hen gekocht met een eiwitgehalte van 13.8 %, is dat goed voor een wit brood en baguettes etc? Heel internet afgezocht en hoe meer je leest hoe onduidelijker t wordt …. Flour is a tricky subject, especially when comparing different flours from different countries. When I say bread flour I indicate also that you can make this recipe with the flour you use to bake bread (rather than using all purpose flour you would use when baking cakes and cookies). But to make it simple: we use wheat flour or ‘tarwebloem’ in Dutch. We use it in our bread baking, but our ‘Dutch’ tarwebloem can also be used in baking cakes and cookies etc. It’s a very versatile flour and we (almost) never use patentbloem. Patentbloem is a very fine flour which could be used and would work too for making a pizza dough, but tarwebloem has more taste and still some goodness in it in the shape of fiber. We buy almost all of our (organic) flour at the mill (De Zandhaas in Santpoort). It’s much higher quality, you won’t find anything like it in the supermarket I am afraid. 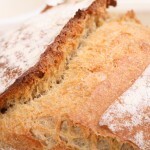 The organic store / natuurwinkel is also a good alternative to look for quality flour. Just curious, where do you buy the “bread flour” stated in many of your ingredient lists? Do you use the ordinary “Patent Bloem” from the local supermarket? Second, when you state “bread flour”, do you alway mean ordinairy white flour?